Book Review and #Giveaway. The Big Event by Anne John-Ligali. Thank you to Rachel at RachelsRandomResources.com for organising this blog tour, and thank you to Anne John-Ligali for my copy of this book. I did a cover reveal for this book at the beginning of the month, and mentioned at that time how excited I was to read it. I was right to be excited, it is a brilliant book. This is a lovely easy reading short story. I think the cover does a great job of representing the inside story, the characters and the sparkles. Constance will be an interesting and friendly character to follow and I am already looking forward to seeing what she does next. The story feels like it is setting a base for more stories to follow, yet still being a very enjoyable read on its own. I think if you use social media yourself, you will be able to identify with the characters that Anne John-Ligali has created. I wonder how many readers will have particular social media users in mind when they read this story? I have a feeling this Author will be very popular, and her books will be quite addictive reading. I can’t wait for the next instalment. I am already looking forward to the next part of this online friendship story, which is due out next year. And now for an amazing giveaway that suits this book so well. Sorry international’s but its UK only due to the prize location. 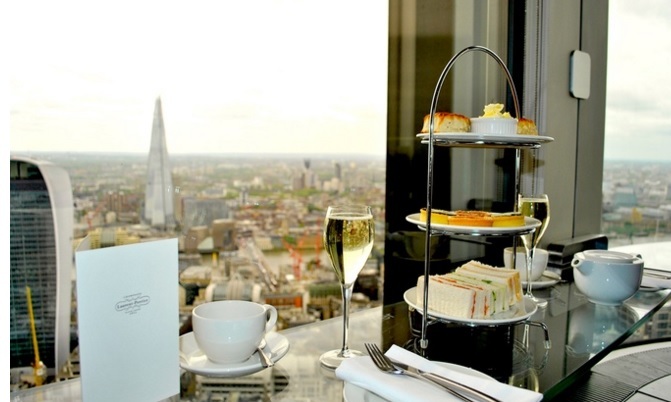 You can win a Sparkly afternoon tea for 2 at London’s Vertigo42 in Central London, and an e book copy of the wonderful book The Big Event. All you have to do is follow the link below where you see all the terms and conditions. Fill in the form and say why you would like to win the prize. The competition closes on December 15th, and the winner will be announced on Anne’s social media pages and blog. So why wait, press the link and fill it in now, you could use the prize for yourself or give it as a special Christmas gift. Here is the link again, press it now and tell Anne why you want to win. AnneJohnLigali.com/why you want to win. And are some links where you can stay in touch with the Author and hear about new releases. And now to really tempt you into the lovely world of The Big Event is Anne’s trailer for the book. Originally from Peterborough, Anne now lives in London. After moving to London, she studied graphic design at the University of Arts and has held a number IT administration jobs in the city. Anne continues writing and aspires to write more women’s ficton books, a non-fiction book and several children’s books.